According to the American Diabetes Association, 25.8 million people in the United States - more than 8% of the population - have diabetes. More than 1.6 million new cases are diagnosed in the country every year and, if current trends persist, 1 in every 3 Americans is expected to have diabetes by 2050. The disease costs about $174 billion annually, and is currently the seventh leading cause of death in the U.S. and the first cause of new cases of blindness among adults, nontraumatic lower limb amputations, and kidney amputations. For years, many leading companies have engaged in research and development efforts aimed at achieving an eventual cure. Federal R&D Tax Credits are available to support credit eligible diabetes innovation activities. Type 1 diabetes is most common in children and young adults, reason why it was once named juvenile diabetes. It represents only 5% of all the diabetes cases and is characterized by the body's inability to produce insulin. This condition can be managed with insulin therapy or similar treatments that, however successful, represent a life-long dependency. Type 2 diabetes is characterized either by an insufficient production of insulin or by the body's inability to respond to the hormone (insulin resistance). Gestational diabetes occurs when pregnant women, without previous diabetes diagnosis, start experiencing high levels of blood glucose. Causes of diabetes are not clearly defined but the disease has been linked to genetic risk factors, environmental aspects, and lifestyle factors, particularly obesity. This is especially worrying in a country where average human body weight has increase disproportionately in the last decades . The accumulation of glucose in the blood, caused by the absence or inaction of insulin, can cause various complications. The shortage of or resistance to insulin undermines the provision of energy to the body's cells. This can lead different diabetic emergencies, such as diabetic ketoacidosis and hyperosmolar nonketotic state. Over time, high blood glucose levels can lead to cardiovascular diseases, strokes, peripheral vascular disease, kidney diseases, blindness, and nervous system damages that can eventually lead to amputations. Other examples of innovative approaches to diabetes research include Lilly's focus on specific markets, such as African American and Asian patients. The company has recently opened a Research and Development Center focused on the Chinese population . Similarly, the Danish company Novo Nordisk has adopted a unique concept that combines basic research and early proof-of-concept trials. This approach is at the basis of its recently inaugurated Type 1 Diabetes R&D Center, in Seattle, WA . 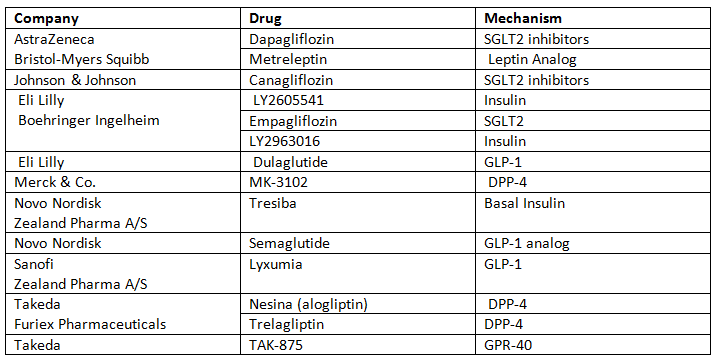 GlaxoSmithKline has also rearranged its R&D activities, organizing it by therapeutic areas, rather than by functions. The company's metabolic pathways therapy area unit is responsible for the complete process of diabetes drugs development from the early stages of drug mechanisms to the marketed product. This approach is said to close the gap between scientists and end-users, increasing patient visualization. In a recent article entitled "The Race in Diabetes R&D" , Murray Stewart, head of GSK's metabolic pathways therapy area unit, highlights the most promising efforts in diabetes research. In his words, "sophisticated approaches are on the horizon that may come close to the Holy Grail - curing the disease completely". These include beta-cell transplant and/or rejuvenation as well as the stem cell approach. However, pharmaceutical groups face significant challenges in the advancement of diabetes treatments. In addition to the high costs, growing demands from regulatory bodies represent further obstacles. This is particularly due to controversial drugs, such as GSK's Avandia , whose adverse effects have intensified the discussions on safety risks of diabetes therapies. The Food and Drug Administration has recently delayed the introduction of Novo Nordisk's potential blockbuster diabetes drugs, Tresiba, which, according to the agency, must go through additional clinical testing on its cardiovascular effects. In an effort to combine resources, AstraZeneca and Bristol-Myers Squibb have established a marketing partnership denominated "Diabetes Inc". In the words of Jan Lundberg, Executive Vice President, Science and Technology and President, Lilly Research Laboratories, "conquering a devastating disease like diabetes requires innovation, collaboration and investment". In a scenario of high investments and growing regulation standards, federal R&D tax credits are available to support ever more pressing diabetes innovation activities.